A great option for decorating your party space! 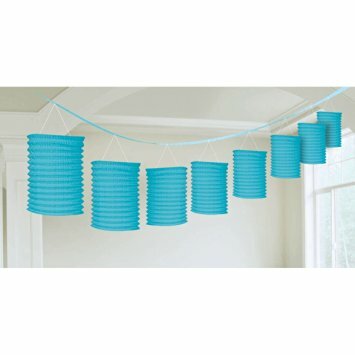 The Blue Lantern Garland is a neat party decorating option! It is fully assembled and ready to go, you simply need to pull out each of the lanterns once hung. The garland features lanterns in blue which are hung from blue ribbon. This lantern garland would look fab strung across a party space. It’s a long garland giving you lots of options. Each garland contains 8 paper lanterns which are 10 x 16 cm.